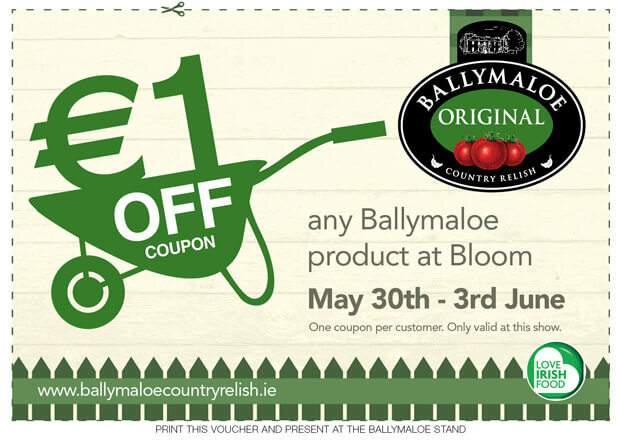 Ballymaloe Country Relish are delighted to be going to Bloom in Phoenix Park next weekend Thursday 30th – Monday 3rd June. Bloom will be open daily from 10am-6pm. Be sure to drop in and say hello we will be in the Love Irish Food Marquee. Free parking and a shuttle bus service will be available for the duration of the show. Click on this link to open a printable version of our Bloom Festival Coupon. Click -> Bloom Festival Coupon.